You can’t see or hear me, but I am jumping up and down and screaming my excitement because FOUR (as in 4!) of our members have been selected to attend the Take a Stand Orchestra Festival at the Aspen Music Festival and School this summer. This is such an honor for us all! They are accepting only 100 kids from the entire Western United States to form this orchestra, so for our program to be sending four is an amazing achievement. We are all so thrilled for them, and are looking forward to being represented by these wonderful young musicians. We are all counting on you four to keep journals, take pictures, make notes, and bring back everything you can to help us share in the experience. We are so proud of you ALL (all 90 of you!) and so glad to see all of our hard work and dedication pay off like this!!! What a great team we are!!! The National Take a Stand Festival is a three-year project that began in 2015 with the creation of an International Teaching Faculty, who will serve as master teachers at two regional youth orchestra camps in 2016, culminating in a 7-day national youth orchestra camp in 2017, featuring a final performance led by LA Phil Music Director Gustavo Dudamel. Throughout this project, world-renowned conductors, guest artists, and master teachers will bring their artistry and mentorship to students from communities across the United States who have been learning in El Sistema-inspired programs. By offering young people the opportunity to learn from exceptional musicians, become ambassadors of their programs, and – for many – travel out of state for the first time, the project aims to develop a model for excellence and a national community of citizen musicians from historically excluded populations in the United States. Students will not only have access to top artistic and educational resources, but will experience some of the world’s finest learning institutions and concert venues such as Walt Disney Concert Hall, the Hollywood Bowl, Bard College’s Fisher Center, and Aspen Music Festival’s Benedict Music Tent. Learn more about this project by reading the Press Release. 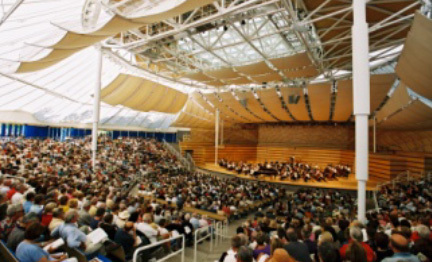 The first gathering of students from El Sistema-inspired programs from the western states, these days will culminate with a concert in the Benedict Music Tent conducted by Robert Spano, Music Director of both the Atlanta Symphony Orchestra and the Aspen Music Festival and School. The first gathering of students from El Sistema-inspired programs from the eastern states, these days will culminate with a concert in the Fisher Center conducted by Leon Botstein, President of Bard College and Music Director of the American Symphony Orchestra. These 10 faculty members will be joined by two representatives of Venezuela’s FundaMusical, who will serve as Cello Specialist and Double Reeds Specialist.